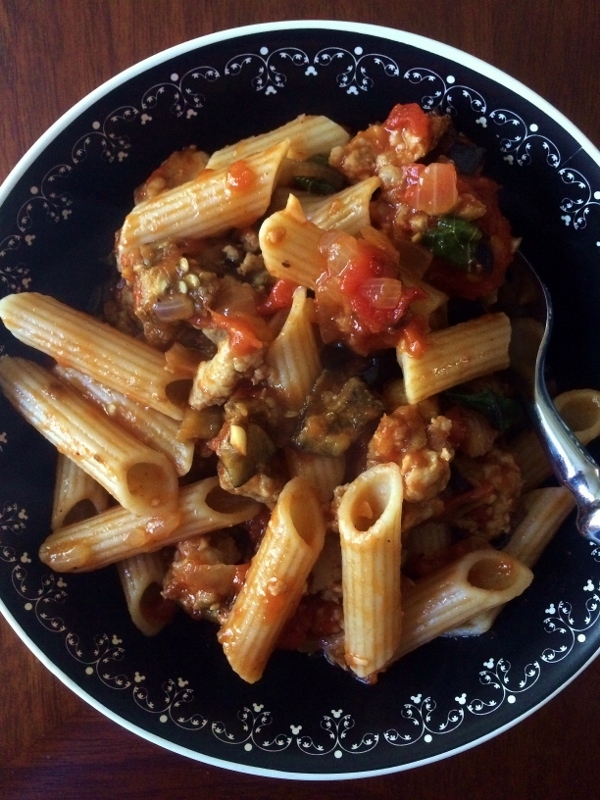 Looking for a delicious way to use up some very in season eggplant? We've been getting tons of eggplant weekly from our local CSA, and it's fun coming up with different ways to use it! 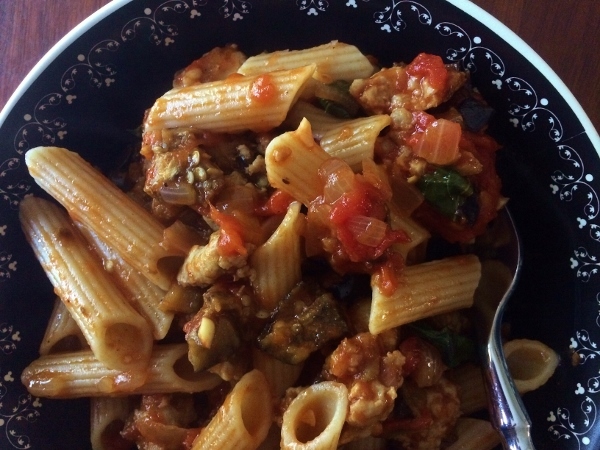 An easy and super satisfying option is to make this twist on a classic pasta alla norma, a Sicilian pasta dish featuring eggplant, tomato sauce, and basil. This version adds another layer of flavor with some sausage. You could use spicy or sweet, but even the sweet had so much flavor and just a tiny bit of heat. The original recipe called for only 8 ounces of pasta for a heck of a lot of sauce. We bumped it up to 12 ounces of gluten-free penne, but even a pound of pasta could have comfortably handled this quantify of sauce. This pasta turned out excellent, and was truly umami to the 9th degree. Heat oven to 500°F. Put eggplant on baking sheet and drizzle with 2 tablespoons oil. Toss to combine and season with salt and pepper. Bake, turning occasionally, until soft and caramelized, about 20 minutes. Transfer to a rack; set aside. Heat remaining oil in a large skillet over medium heat. Add onion and cook, stirring, until soft, about 5 minutes. Add garlic and cook, stirring, until garlic softens, about 3 minutes. Add sausage and cook, using a wooden spoon to break up into small pieces until browned, 16 to 18 minutes. Add tomatoes and half the basil, season with salt, and cook until heated through, about 5 minutes. Meanwhile, bring a large pot of salted water to a boil. Add pasta and cook, stirring occasionally, until just al dente, about 10 minutes. Drain pasta and return to pot. 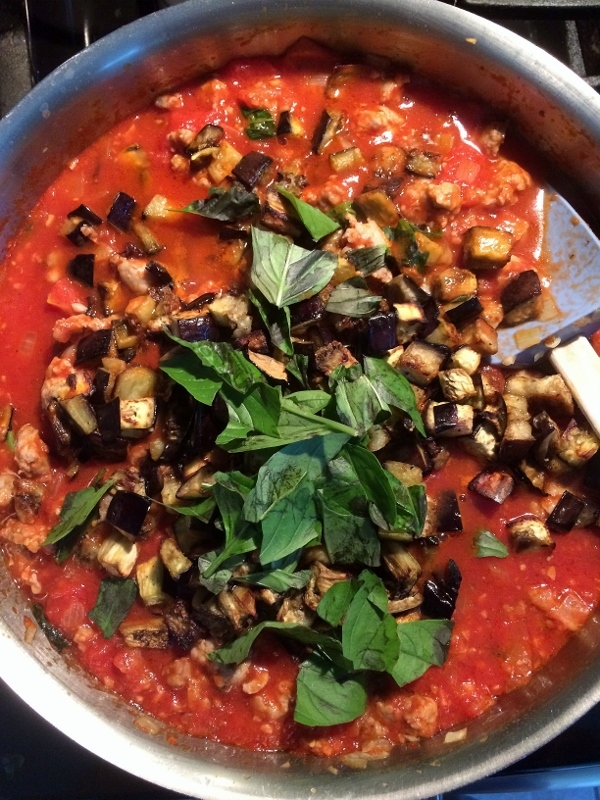 Stir reserved eggplant into tomato and sausage sauce. Pour over the pasta and toss to combine. Stir in remaining basil and season with salt if needed. *Note* The original recipe called for 8 ounces of pasta, which was obscenely small for the amount of sauce. 12 ounces of pasta still yielded a very saucy, albeit delicious, final product. You could probably get away with making this recipe using a full pound of pasta if you desire.